Here's a unique radio show where the artist Robert Wyatt, ex- of Soft Machine and Matching Mole, rehearses and plays new songs in the station's studio. Live on Italys RADIO3, February, 1981. The show was recorded between Feb 16 and 21. In 1981, Robert Wyatt was invited by the Italian national radio channel RADIO3 to play, rehearse, and record freely in their studios. This is what came out of those sessions. Tracks with "talk" are the translation of a Wyatt interview; they are in Italian. 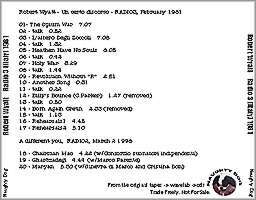 The last three tracks are from another radio program where some of the people who recorded the covers cd "A different you - Robert Wyatt e noi" play the songs live. Billys Bounce and Born Again Cretin appeared on a now out-of-print 1994 Rough Trade compilation, Flotsam Jetsam. They are not offered here. It is clear "entertainment" wasnt on Wyatts mind. Click on the highlighted tracks to download the MP3s (these are high quality, stereo MP3s - sample rate of 192 kibit/s). As far as we can ascertain, these live tracks have never been officially released. These tracks are no longer available for download as they have been officially released. 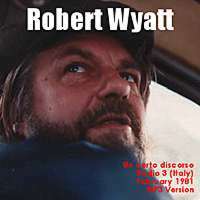 Click here to visit AllofMP3.com to buy Robert Wyatt albums.